Pelican's Watch features attractive landscaping and a beautiful oceanfront pool. This condominium offers a screened-in deck with ocean view from master bedroom. It also has a full-size washer and dryer and a wet bar. Conveniently located on the first floor with elevator accessibility. 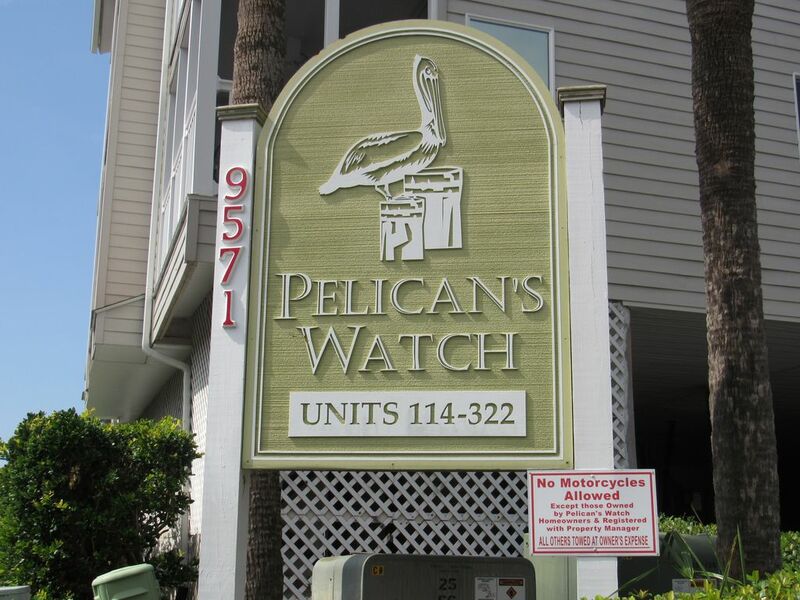 Pelican's Watch is located close to over 100 of the best golf courses in Myrtle Beach. Pelican's Watch is centered on the popular Shore Drive area. It is approximately a 15-minute drive from Myrtle Beach airport. This condominium is approximately four miles from Barefoot Landings, which has over 100 shops and entertainment like Alabama Theatre and House of Blues, and many great restaurants. Right across the street is the popular Ocean Annie's, an outside beach club and bar with live entertainment. The Apache pier is one-half mile north of Pelican's Watch. It offers fishing, entertainment, and dining. Approximately four miles is the Carolina Opry/Dixie Stampede. Also, Broadway at the Beach, which offers many shops and theme restaurants such as Nascar Cafe, Hard Rock Cafe, All Star Cafe, and Planet Hollywood is located seven miles south of Pelican's Watch. Two nice waterparks, Nascar Race Park and A New Hard Rock Amusement park within 10 minutes. All rates include cleaning fees and taxes. Linens available for additional charge. Renters must be 25 years old. Linens included in rental price. Nice condo very convenient area! Very nice place to stay! I’ve stayed at several condos on Shore Drive and this is truly one of the better places I’ve had the pleasure of staying at. Extremely close to the beach and pool. Condo was clean and spacious. Would definitely like to rent again. Thank you so much for the great vacation! First and foremost I want to say that we had a delightful stay. The Brooks condo felt like home. I’ve stayrd places that had that stuffy, overwhelming, don’t touch, feeling... this way wasn’t like that at all!! I did have major disappointment when we pulled up and realized we were not oceanfront (my mistake at booking) but we weren’t even ocenview as described. You could see a tiny sliver of the ocean from the 2 foot wide balcony if you stuck your head out and around the corner, mind you this balcony is barely big enough to stand on, in all the condos not just the one we stayed. Thankfully it was just across the street though as I have a 4 year old and a disabled mother. The street was a dead end so it wasn’t busy at all. The beds were comfy after a long day on the beach or shopping as well..
Whoever cleans though definitely needs to try harder as there was still toothpaste in the master bathroom sink and the shower could use scrubbed as there is built up soap scum on the shower hanger and the metal on the door. We also arrived after an 8 hour trip to no toilet paper in the entire place. There were a few things that needed updated but mostly the middle bathroom the transitional strip is coming up and the nails are rusty and my 4 year old cut his foot on the strip. Also the tv in the bedroom as you come in the door, does not work or isn’t connected to anything rather. Overall, we would probably stay here again though. Kim was very quick to respond to anything I needed via text as well. Enjoyed my stay here with my family. The condo was very well kept and clean. There were numerous attractions such as restaurants and shopping centers near by! Enjoyed my stay at this condo. If you are looking for a oceanfront pool this is the way to go! Enjoyed the grill pit, nearby golf courses, shopping centers, restaurants and bars near by. Ocean Annies and Flip Flops are walking distance bars if you're looking for a fun night out.